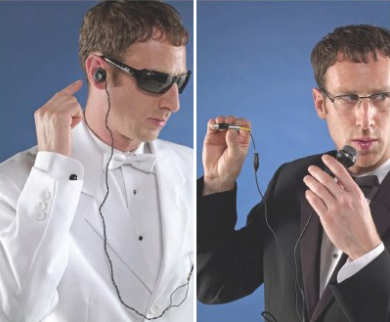 This handy DIY laser pointer communicator requires little more than time, an old laser pointer, some parts from your local RadioShack, and, of course, a tuxedo. Here's the PDF file (eyes only!) you'll need to get started on what actually sounds like a pretty neat little 15-minute project. Basically, the audio signal from the attached microphone varies the power output of the laser. This, in turn, causes the laser's brightness to fluctuate in a way that follows the shape of the sound wave.